The following settings cannot be selected if the page contains a portlet container. This setting is available if the dialog was opened via the properties of a view page. If the dialog was opened via the application properties, the setting is automatically activated and is not shown in the dialog. If this setting is activated, the view page will be used as a portlet. You can provide the portlet with a description here. Opens a dialog where the description can be entered in the different portal languages. With this setting, the view page can be integrated into other applications as a portlet. 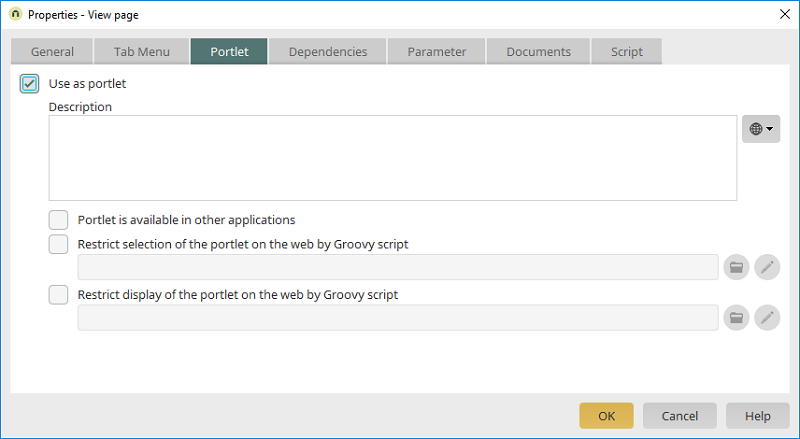 If this setting is active, Groovy script can be used to control the selection of the portlet in the browser. If this setting is active, Groovy script can be used to control the display of the portlet in the browser.